1 of 1 Coat cutlets in bread crumbs and salt. Pan-fry in oil 4 minutes, turning once. 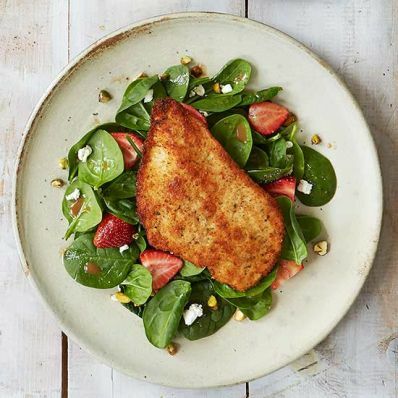 Toss spinach with strawberries, pistachios, cheese and dressing. Serve cutlets over salad. Per Serving: 29 g Fat, total, 453 kcal cal., 26 g pro., 6 g fiber, 25 g carb.